CLICK HERE TO SIGN UP AT VICTIV! Welcome to our review of VICTIV, a new and exciting daily and weekly fantasy sports site! Draft a team today, get paid tonight when the games are over! One day fantasy sports leagues (aka: DFS) are recreating the way the game is played and there is nothing more exciting! With top of the line software, a huge 100% bonus up to $1000, and a great loyalty rewards program, VICTIV offers a great daily fantasy sports experience. Draft now and cheer for your favorite weekly fantasy football, daily fantasy basketball, daily fantasy baseball, fantasy golf, and fantasy hockey players. Play for free or compete for real money. Win cash daily - no season-long league commitment. 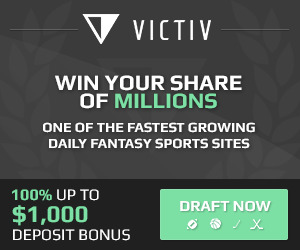 VICTIV offers one of the LARGEST first deposit bonuses from any DFS website. Join now and learn why their leagues are better than season-long competitions - skill-based gaming, no commitments, and completely legal in the U.S.
VICTIV also offers a unique first time depositor promotion where you get three $5 head to head chances at beating their computerized lineup, Victron. Each free entry can win you $5! At Victiv, you can play all of the major fantasy sports leagues: NFL, NBA, MLB, NHL, PGA. They offer standard salary cap leagues, double ups, head to head, guaranteed prize pool contests, and satellites that get you entries into bigger tournaments. You can deposit using all major debit and credit cards, including VISA, MasterCard, Discover and American Express. OR deposit with your PayPal account. Victiv operates with a EV SSL Plus certificate from digicert. They use STATS LLC (The BEST!) to provide real-time fantasy player rankings and scores for every game. Share your refer-a-friend referral code with your friends and fantasy leagues to earn up to $20 in free weekly fantasy football, daily fantasy basketball, daily fantasy hockey, or daily fantasy baseball cash per friend. Give your friends free daily fantasy sports money and earn for yourself at the same time! VICTIV.COM - CLICK HERE TO SIGN UP! Deposit Options: Paypal, VISA, MasterCard, Discover, and American Express. Withdrawal Options: Payouts are made via Paypal/Check and are FAST! Bonus/Promo Code: They don't use promo codes. Minimum League Entry Fee: Offers free games. Cash games start at $2.00 and go up to $200! For each real-money contest in which you participate, every $1 in contest entry fees earns you 10 PLAYER POINTS. Your player points are then multiplied by your tier level and are awarded as Victi. You start to receive Victi once you reach the Bronze Tier. Convert the Victi you earn into cash tickets or other merchandise via the Victi Store. Check back regularly as we'll continue to add great gear, merchandise, trips, and experiences to the Victi Store. Basketball: 2 G's, 3 F's, 1 C and 2 FLX's, your final player is a sub. Your sub can be any athlete with a salary of $50,000 or less. Points Allowed (PA) will not include points scored while a team's offense is on the field (i.e. points off offensive turnovers, or missed field goals returned for a touchdown). More Reasons to Open an Account at VICTIV: Victiv offers a great option where you can join a heads up game without knowing your opponent until the game starts. This eliminates those sharks from preying on the weaker players, meaning we all have a chance to win heads up! Their VICTRON computerized lineup in which you play three times to win $5 with your first deposit is a very clever promotion. Personally, I beat Victron all 3 times, and instead of waiting for a bonus like on other sites, I immediately got $15! Victiv's tiered rewards program is a great loyalty program that comes with plenty of freerolls! With each level promotion, you receive point multipliers meaning you can advance even faster as you move up a level, and each level has better benefits! Become the 2015 NBA Champ and win the $25,000 1st place prize in our fantasy basketball contest on April 3, 2015! Qualify for the $300 buy-in event through cash entry or by winning any of our commission-free qualifier satellite contests. Become the 2015 Green Jacket Major Champion and win the $5,000 1st place prize in our PGA Masters contest on April 9, 2015! Qualify for the $200 buy-in event through cash entry or by winning any of our commission-free qualifier satellite contests. Victiv Daily Fantasy Baseball - DFBB players are going to love this! You get to use a pinch hitter who takes the place of one of the players in your lineup if the PH stats are better than one of your rostered players! Fanduel: Enter promo code ROTOPICKS into the box to receive a special 100% sign-up bonus on your first deposit up to $200! Draftkings: Enter promo code ROTOPICKS when signing up and receive a GIANT 100% bonus up to $600 in free cash! Freerolls Explained - A great way to get your feet wet if you're new to daily fantasy sports betting. Also a great way to make some risk free money! DFS Site Rake Comparison - Daily fantasy sports sites collect a small percentage of each league entry fee called "rake" (just like poker). The rake is what keeps them in business and pays their bills. This article features a comparison of what each website charges so you can get the most value for your dollar! Loyalty Programs - Daily fantasy sports sites will fight for your business. Get rewarded by playing at a site that offers free vouchers for entries to cash leagues, merchandise, contests, prizes and more! Free Daily Fantasy Leagues - List of sites offering free salary cap, snake draft and double up leagues! Test the waters before you play and receiver a generous sign-up bonus when you decide to take the leap into cash league games! Daily Fantasy vs. Season Long Leagues - Daily fantasy leagues have taken the web by storm and there's no signs of this trend slowing down! Draft today, get paid tonight! Money Management - Adam gives advice on what of the biggest shortfalls of all daily fantasy sports players; properly managing their account balance. Are Daily Fantasy Sports Legal? - Yes, however, there are a handful of states where it's not allowed. We've got the full list as well as an explanation of the law that states DFS is a game of skill. Daily Fantasy Sports Terms - DFS has taken the industry by storm! With that has come a whole new language of terms, jargon, lingo, acronyms and synonyms! We list them all here! Copyright 2013 rotopicks.com. All Rights Reserved.